The Sullivan County Sheriff’s Office, in Tennessee, has become famous for coming up with a unique approach to catching wanted people. They’ve created a weekly online game show called “Busted Bingo”, where wanted people are assigned numbered balls and randomly selected for an all-inclusive stay in a county jail cell. It’s probably the world’s first game show that no one wants to win. The first episode of Busted Bingo aired on November 15, 2017, and generated quite a bit of media coverage, especially on a local level. Sheriff Wayne Anderson, the host of the unusual game said that the game was an innovative way of getting the public involved in the process of catching wanted offenders. The idea was that if someone recognized the selected “winner” of the game, they could call the police to turn them in and save officers the trouble of locating them. Believe it or not, it actually worked. The first ever winner of Busted Bingo was busted just a few hours after the episode aired on YouTube. “When you get people involved and you get the public involved, because some of these people might have a job somewhere that we don’t know about and they say well I work with that guy or I work with that lady, whatever, and so they call and turn them in,” Sheriff Anderson said. Like any respectable game show, Busted Bingo actually has its own intro, as well as a game board featuring the players’ photos and corresponding numbers. Every episode, a bunch of numbered balls are tossed into a bingo machine, spun around a few times and then a lucky winner is selected. The wanted person’s photo and criminal offenses are shown on screen so that viewers can get a good look at them. Finally Sheriff Anderson advises the winner to kiss their loved ones goodbye and turn themselves in, because he and his police officers are coming for them. “Girl, you might as cowgirl up, come on in, kiss your boyfriend goodbye, give your mama a big hug — ’cause if you don’t we’re gonna come and get you and bring you to jail,” Anderson warned Carrie Winters, the first ever winner of Busted Bingo. Despite criticism that Busted Bingo is unprofessional or that it mocks the justice system, the game show has been going strong, with new episodes being posted on YouTube and Facebook every week. Sheriff Anderson is fully aware of the controversy surrounding his unorthodox method, but for him it’s all bout bringing people to justice. And then there’s the fact that Busted Bingo actually works. 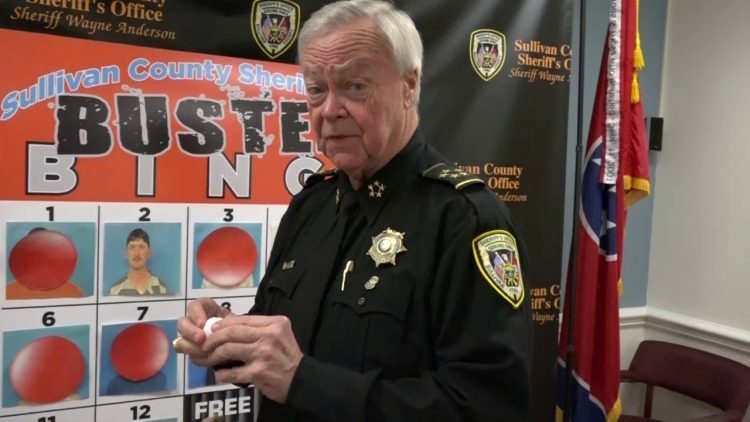 As Anderson, told WJHL last month, the controversial game show has helped the Sullivan County Sheriff’s Office catch over a dozen wanted people. Busted Bingo is so unique that a German film crew recently flew from Munich to do a documentary on it. “We found it very interesting and impressing that police officers find creative and positive solutions to deal with their daily struggles,” said TV producer Lena Ledwa.